A cohesive work team takes hard work and a commitment toward a common vision. Today’s managers are asked to build teams, motivate staff and perform other managerial functions. In this role, your ability to understand human behavior and group dynamics is more critical to your success than your technical knowledge. Maintain morale in downsized surroundings. Help the group cope with change, transition and loss. Communicate under pressure with people who are different from you. Resolve conflicts, tension and heal old wounds/baggage. Diminish the “negatives” in a downsized atmosphere. Understand the stages of team development: the challenges and the joys. Increase understanding and appreciation of different work styles. 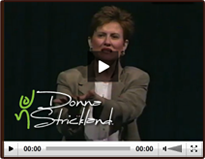 Each of Donna’s team building programs is highly customized. Her programs and training sessions can range from half-day to multiple days. “Train the Trainer” leadership programs are also available. Often, Donna works with individual teams on an ongoing basis.